The taskbar preview in Windows 7 and 8 will give you a glimpse of each open Firefox window. But if you make use of tabs and don’t use additional windows then it makes sense to change the preview setting from windows over to tabs. Would you like to be able to see previews of individual Firefox tabs from the Windows 7 and 8 taskbar? By default, Windows will only show previews of the top tab on each open Window. 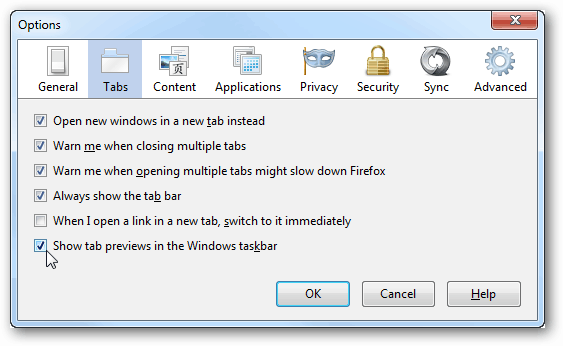 But, the whole point of having tabs is so you don’t have to use old IE6 habits of running multiple Windows. Here is how you can run a single Firefox window but still view previews of all your open tabs from the taskbar. 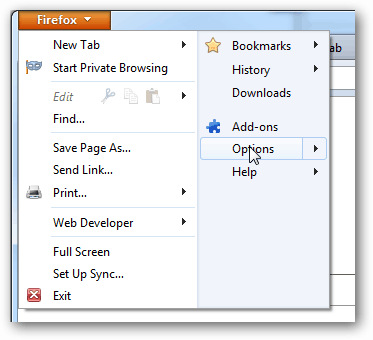 Open Firefox and select the Firefox >> Options from the orange menu at the top-left. In the Options menu click the Tabs tab and check the box titled Show tab previews in the Windows taskbar. Click OK to save changes. Firefox will now display previews of each open tab when you hover over the Firefox icon in the Windows Taskbar. This will work both Windows 7 and 8. Me too. I have disabled this feature in my firefox and Avant browser.